Please note postage choices now included in SOME prices only. If you are in a hurry for your products please choose the XPRESS OPTION in relevant sections , as this will get your product to you in the quickest possible times. Xpress ETA time is usually 2-6 working days Australia Wide. Regular Postage is anything from 3-6 working days WA and 6-14 working days all other locations. Have used Zeolite before from yourselves for a horse who was a very bad windsucker. He doesn't do it any more thanks to Zeolite. 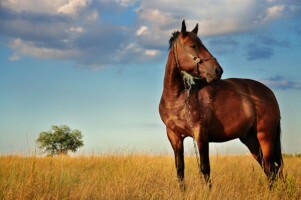 I have recommended Zeolite to other horse people as not only did he stop windsucking but also gained weight. 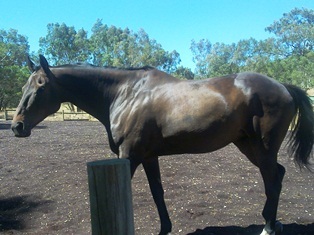 With regards to the Zeolite , I have sent you some before and after photo's of my 17.1hh TB Gelding! Photos are Oct 2010 (day I picked him up) to Dec 2011 (14 months apart). 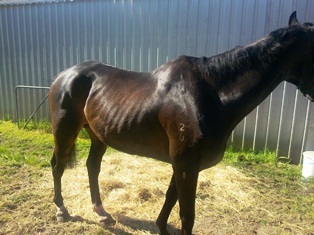 We went to work with increasing his feeds, supplements ,etc ,as he was in shocking condition! His condition was improving all the time, however no matter what I fed him his condition wasn't improving after about 6 months. I became frustrated and had tried lots of different suggestions....then I came across Zeolite on a website. Zeolite made a world of difference to him! I believe that his health (and weight) jumped to a whole new level once I put him on Zeolite. I wish I had heard of Zeolite right from the start when I first got my Gelding. He's been on the Zeolite now for about 6 months and he's in Fantastic condition coming into Winter! All my horses are on it now! Disinfectant "SuperSol" Starter Kit . Disinfectant "SuperSOL" 1lt refill - Most Marvellous Stuff On Earth ! Disinfectant "SuperSol" 1lt Concentrate . Colloidal Silver is reported to be anti-bacterial & is soothing to the skin. Superior strength, anti bacterial, anti viral solution.